Villa Shiraz is a luxurious six bedroom private villa which can sleep up to 11 people. It is situated in the Costa Adeje area in Tenerife. It has air conditioning, wifi internet access and satellite TV with English channels. There is a private pool, which is heated in the Winter months. There are plenty of sun loungers around the pool, and a table and chairs for alfresco dining. The villa has amazing sea views from the ground and 1st floor levels. The villa is laid out over 3 floors, including a basement. The villa has been recently refurbished and the kitchen is fully equipped with all the mod cons which you would expect including a dishwasher. There is a separate laundry room with a washing machine. 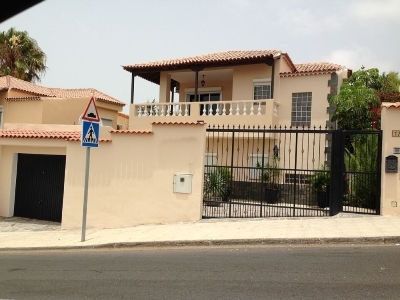 The villa is very secure as it has electric gates and electric shutters on the windows. There is also off street parking. Cots and highchairs can be hired on request. The cost is £25 per cot per week and £10 per highchair per week. There are fitted wardrobes in 5 of the bedrooms with lots of shelves and hanging space. There are large terraces with fantastic sea views off two of the bedrooms on the 1st floor. There would be space for a travel cot or additional bed in two of the bedrooms. A 12th person can be accommodated in a z-bed suitable for a child or small adult. There is an extra charge of £100 per week for a 12th person. If pool heating is required in Spring, Summer or Autumn, this can be provided for an extra charge of 150 euros per week (payable locally). A refundable security bond of £300 is also payable. This will be refunded back to clients after the holiday, providing there are no breakages. Wifi internet access is now available in the villa for £20 or 25 euros per week. This can be paid on arrival. Please let us know if required.